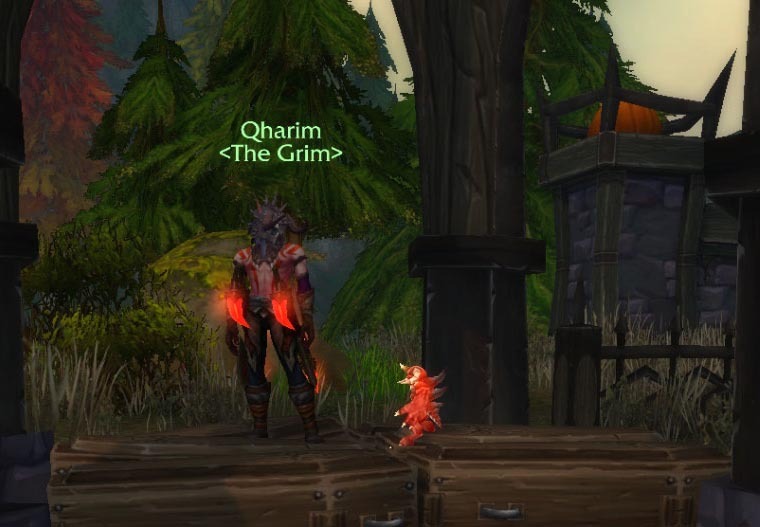 After much deliberation and discussion (and the promise of weekly good loot for 25 wPVP kills), The Grim has decided to faction change to the blue side, and change its name to <The Cheerful>. 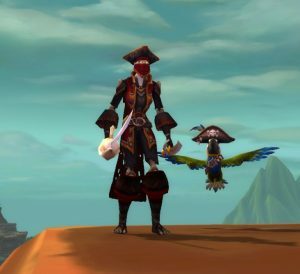 “After seeing ourselves as Alliance in the Battle for Dazar’alor raid, we decided we liked how we looked,” said Awatu, The Grim’s The Cheerful’s leader. “Yeah, I really like doing flippy elf jumps!” That was from Syreenna, whose raid troll gets changed to a night elf in the raid. 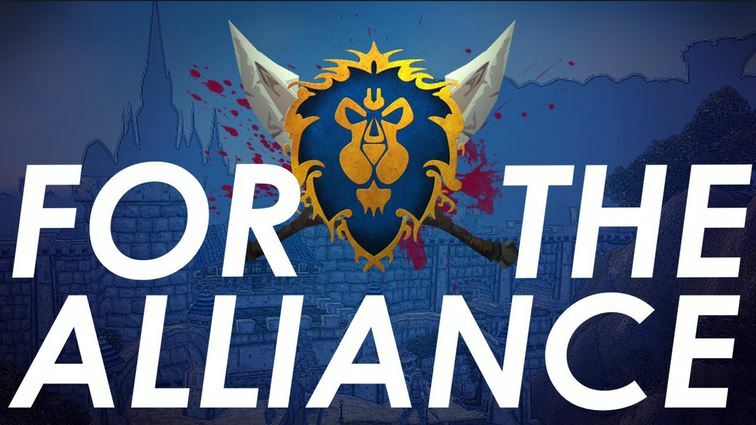 It seems the Alliance have grown bold. 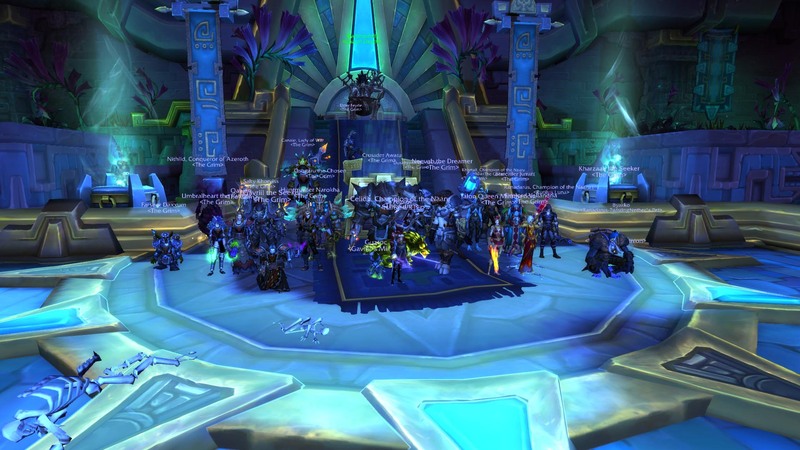 A full assault against Dazar’alor is the last that would have been expected. Yet here we are, I’m stuck behind a desk, and the rest of the Grim bathe in glory flushing the filth out. 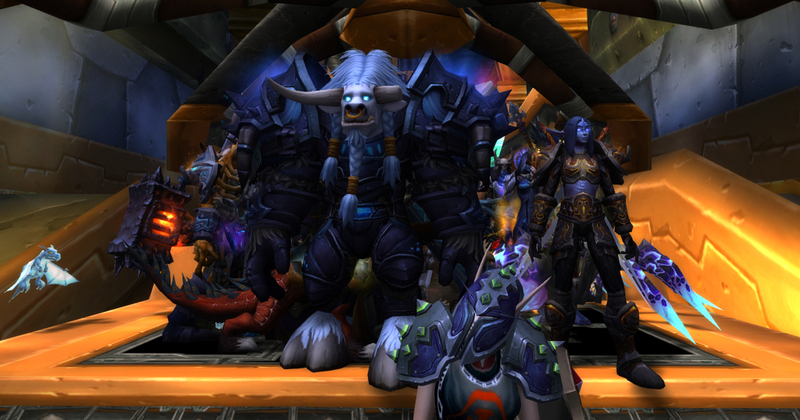 Loa’rohk has served the Mandate well. 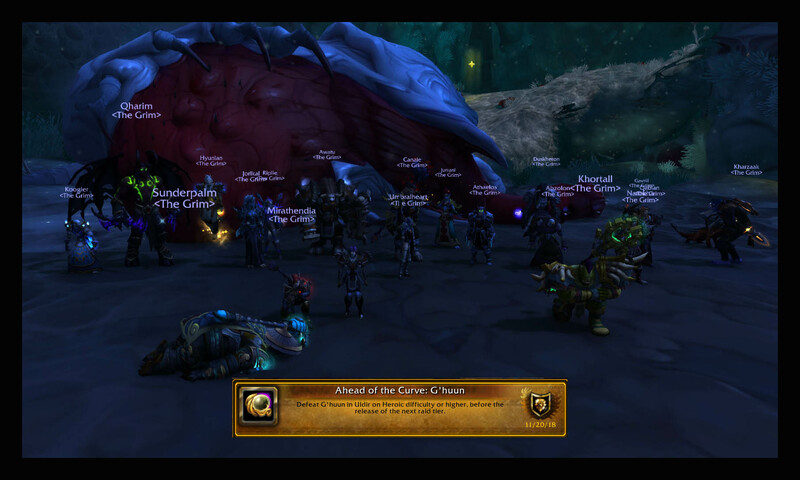 Now we press onward to more heroic adventures. 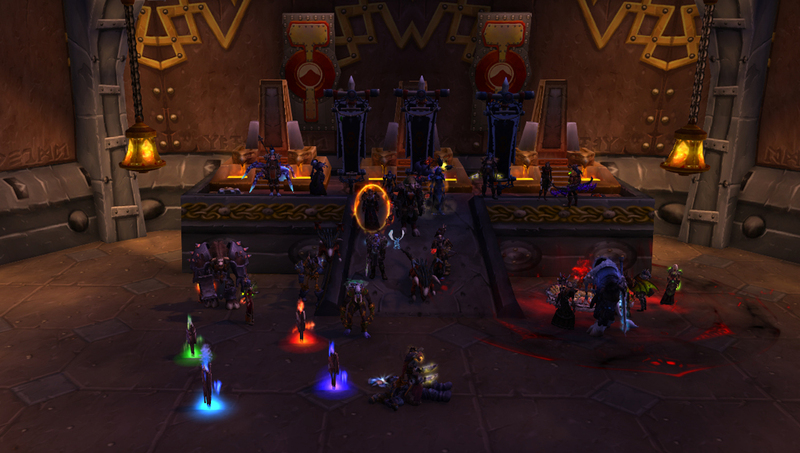 The Dark Iron sent forth Frida Ironbellows and her cronies to protect the Alliance assault from a reward attack. They should have chosen better. 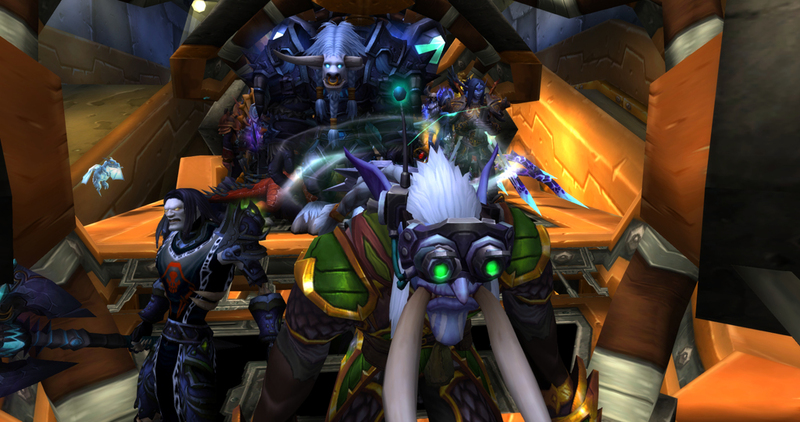 It seems the Alliance fancy the Grim, and take pictures posing as our fighters. Every King must die. Queen Talanji will be easier to continue to earn favor with. Jaina escapes with her life, not for lack of effort on the part of Loa’rohk. 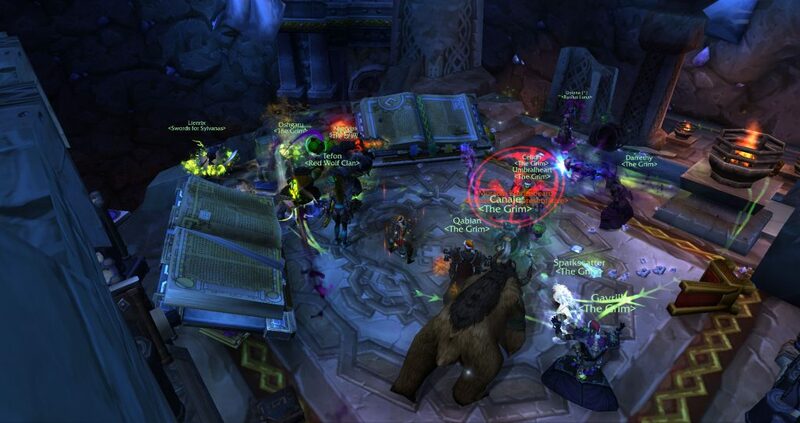 The members of Loa’rohk demand answers from Blightcaller, as he stood by and let Jaina escape. The Grim held a festive Winter Veil party at their old garrison. Gifts were exchanged, food was eaten, booze was drunk, and a good time was had by all! Khorvis Bloodstar won the holiday pet battle, featuring untrained holiday themed battle pets. Many snowballs were thrown in these battles, as snowmen, reindeer, and holiday helpers battled it out among a few less common pets. 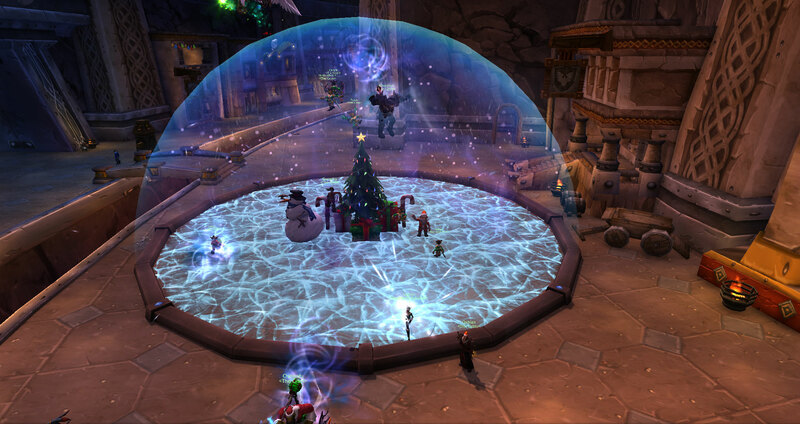 On another night, The Grim decided to bring holiday cheer to Stormwind and Ironforge! 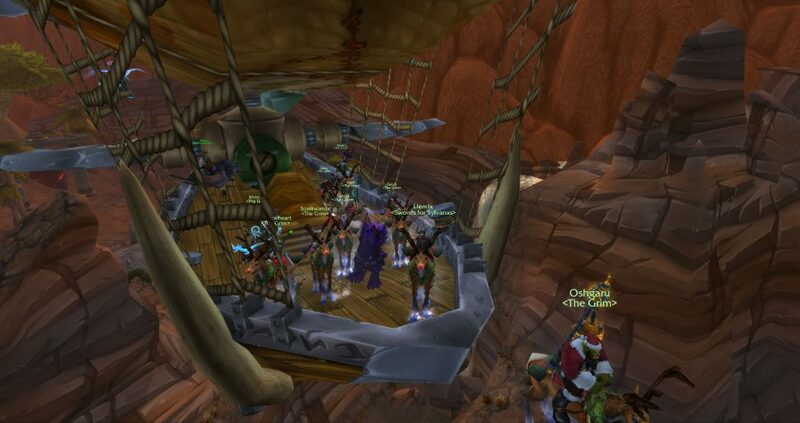 Dressed again in festive clothes, and riding reindeer, the Grim departed Orgrimmar for Grom’gol on the zeppelin much to the confusion of other passengers. A few members of the Swords of Sylvanas accompanied us, and we picked up a few more individuals along the way. 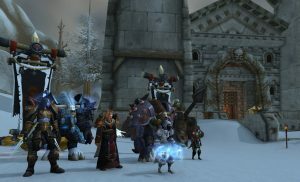 From Grom’gol, they rode their flying reindeer to Stormwind where they met little Alliance resistance as they defeated the Boy King and several of his guards. After that, The Grim set off through the city. Qabian wanted to visit the orphanage, and then the group made their way to the tram. 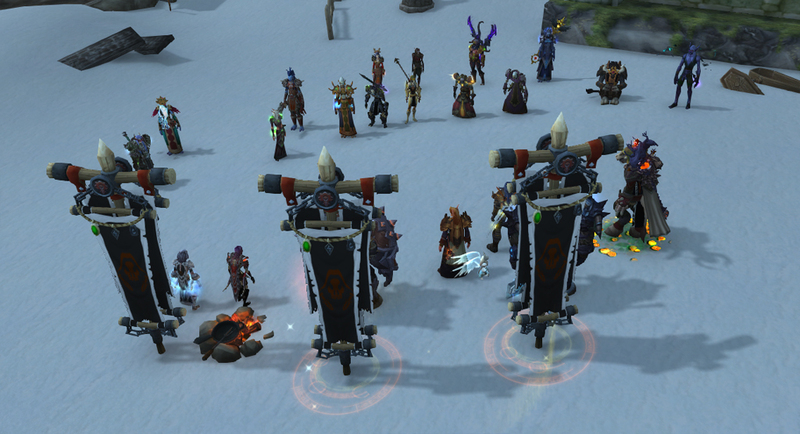 There they encountered a few more Alliance heroes brave enough to fight them, but it did not slow them down much. 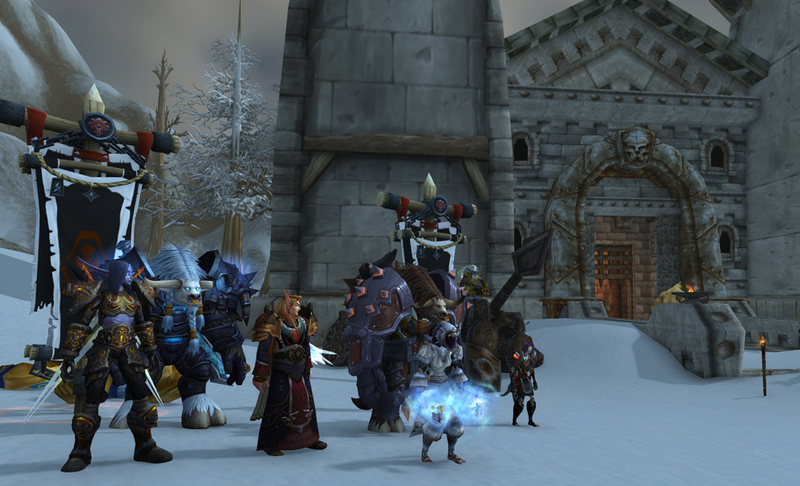 A short tram ride later, and The Grim set themselves loose to bring holiday tidings to Ironforge. First, a visit to Greatfather Winter was in order! 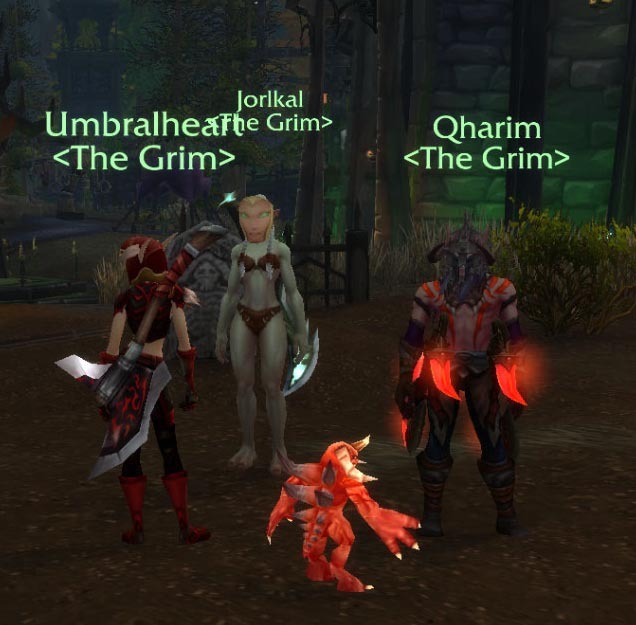 Grim and friends stood patiently in line to tell the old dwarf their holiday wishes. 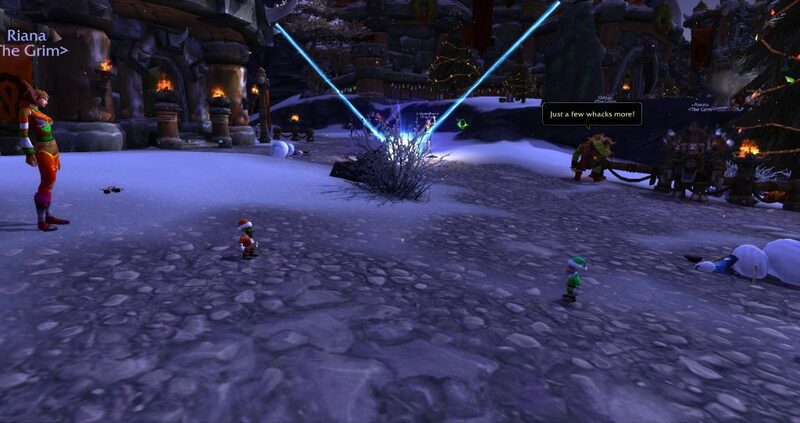 While waiting, they decided the Winter Veil tree could be a brighter shade of green. 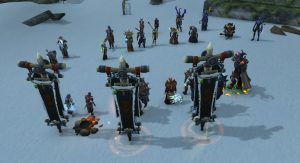 After setting a few fires under the tree and Greatfather Winter, and slaughtering any guards who objected, the group had some fun in the dwarves’ snow globe. Finally, they decided to bring holiday cheer to the dwarf council. 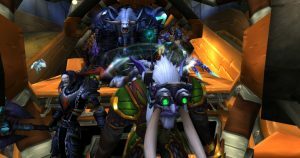 In the middle of the fight though, a group of Alliance, who call themselves The Seventy Third, showed up and interrupted the battle. 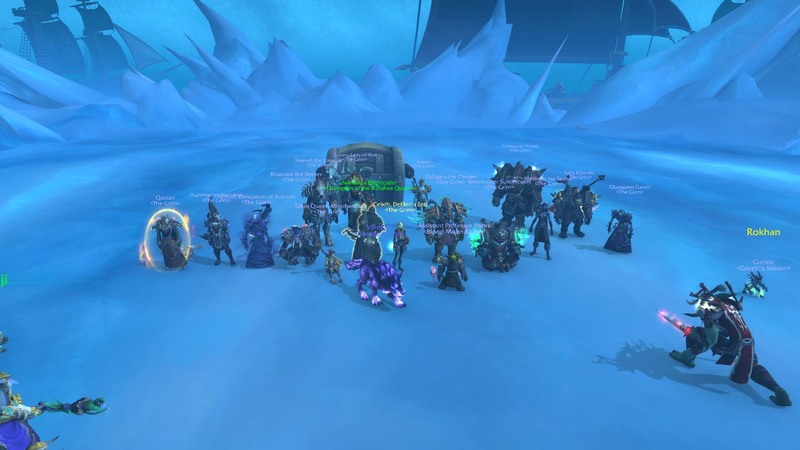 The Grim and friends successfully countered the first wave, but they were pushed back to the depths of Old Ironforge. That didn’t stop them from trying to finish the job on the council though! Unfortunately, The Seventy Third regrouped with even greater numbers, and eventually forced the festive invaders to break ranks and retreat. 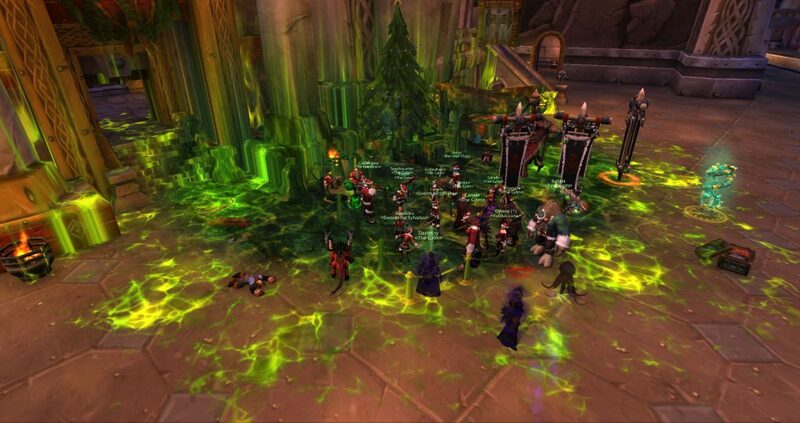 Happy Holidays from The Grim! 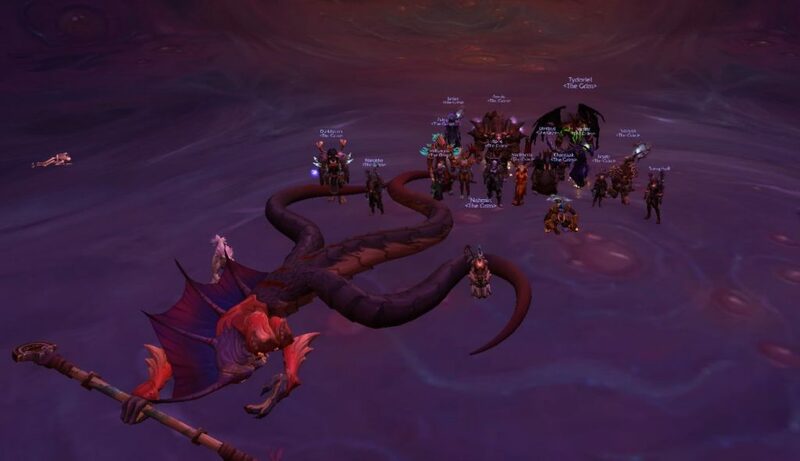 The Grim has defeated Heroic G’huun and earned the achievement Ahead of the Curve: G’huun! 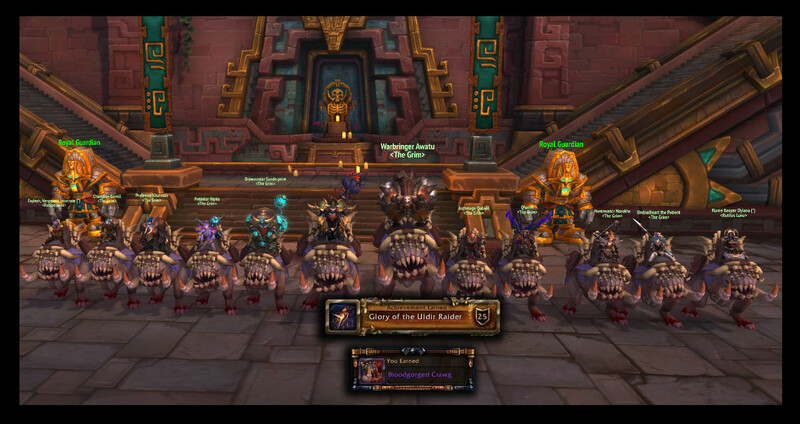 Next goal: Glory of the Uldir Raider achievements! 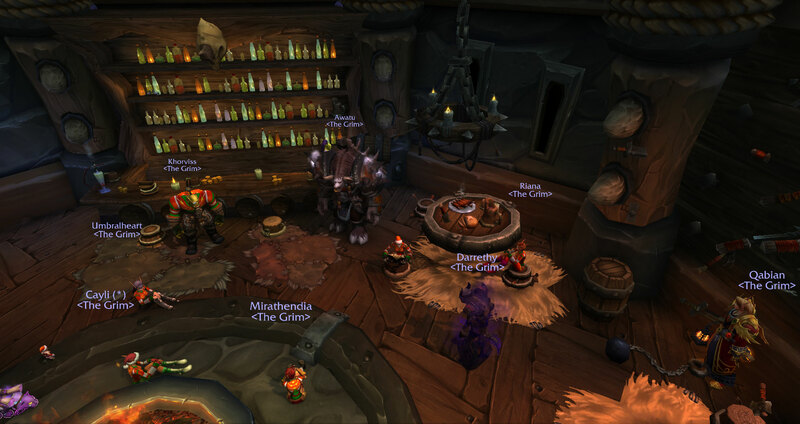 On Monday night, The Grim held its annual Hallow’s End Costume Contest. The hostess was Captain Shadowblade (aka Syreenna). Vashni and Duskheron helped judge the contest. 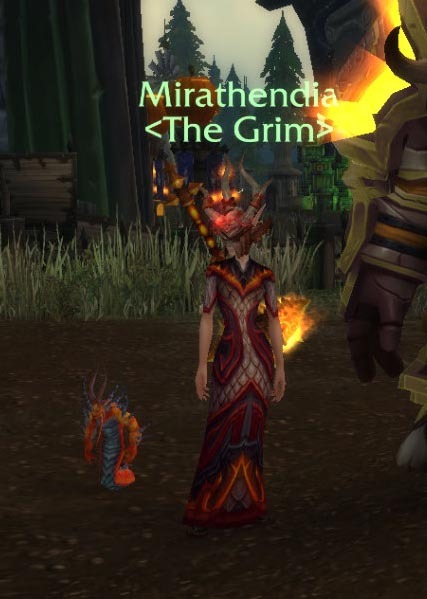 The winner of the contest was an agent of the Firelord (aka Mirathendia). The prize was 10,000 gold pieces. Mirathendia rode up onto the stage on a fiery corehound. “Don’t burn the stage down!” Qharim advised. 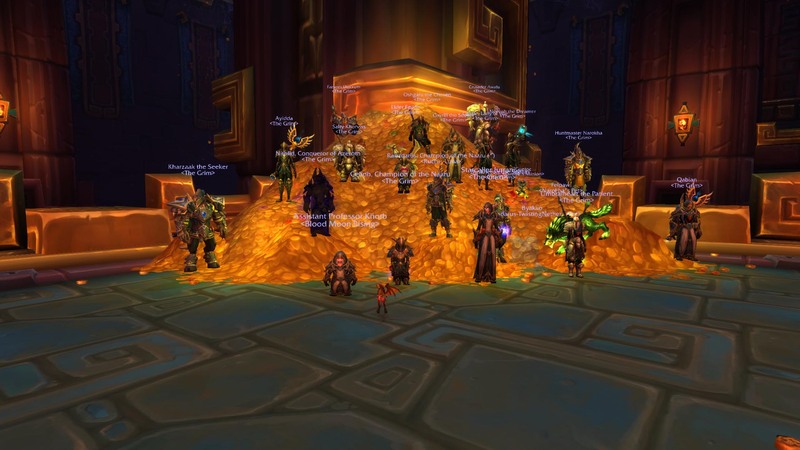 Second place, and the winner of 5,000 gold pieces, was Malygos (aka Qabian). 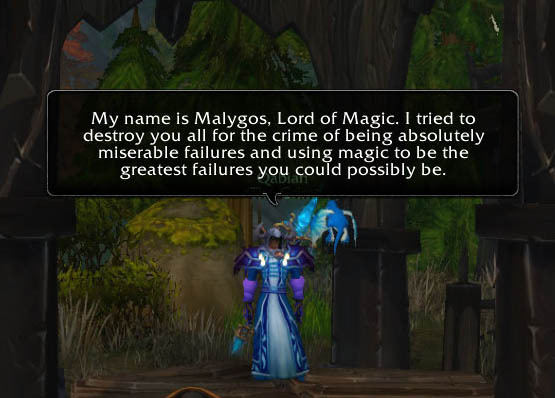 “My name is Malygos, Lord of Magic,” Qabian said. “I tried to destroy you all for the crime of being absolutely miserable failures and using magic to be the greatest failures you could possibly be. But I proved to be the greater failure still, as all my sister had to do was find a ragtag group of nobodies to take me down once and for all.” He paused to yank on the whelpling’s chain. “This is my equally worthless son, Kalecgos. He’s an absolute moron and he’s somehow not dead yet, but there’s hope. All of you should get to work on that. He shimmered back into his normal form. “I’m sure there’s a lesson in all that about family,” he concluded with a smirk. Other contestants, in order of appearance……. Fanyare walked up unannounced onto the stage. Fanyare. 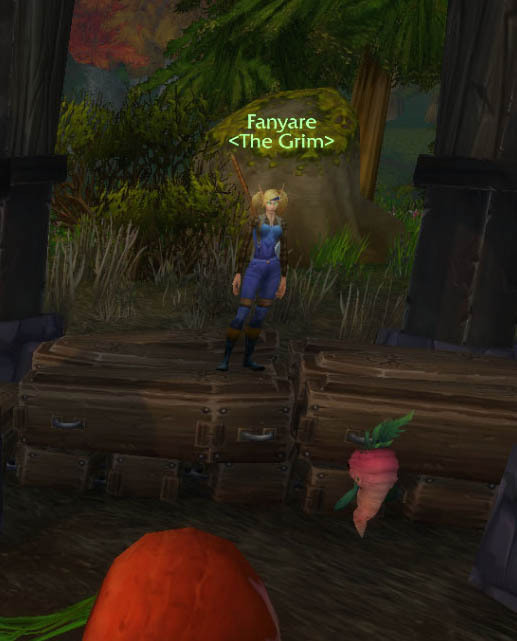 in a drawl voice, like a dwarf that’s been hit on the head, said “I’m Farmer Farmyare, and I grow turnips and Humans in the sludge fields” She bowed down graciously, and then she walked back off just as silently as she walked up. “Ahem…” Umbral started. “What lttle I remember of my life before uh… a few months ago… I recall spending time in Tirisfal Glades. Occasionally I’d hear a fanatical devotion to a particular fighting style emenating from that Scarlet Cathedral… The sound of screaming that came after it was amazing! “He knows we aren’t all blind, right?” Umbral asked. “Bah! I am bad at this!” Qharim flailed off the stage. “What are you?” Umbral asked. “A hot caged elf,” Qharim answered. But Qabian had another idea. “A nightmare,” he suggested. Then she “moo’d” at Awatu. “Part of my costume, Commander!” Jorlkal added quickly. 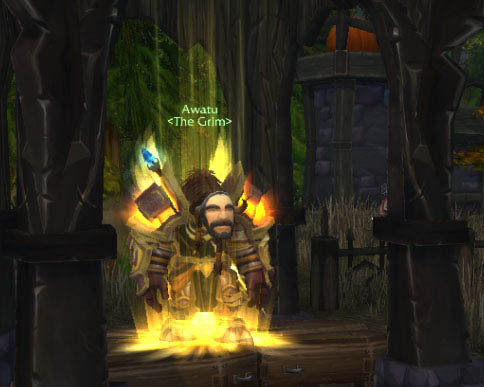 “A freebie for the holiday,” Awatu acknowledged with a nod. One of the earliest events that was popular on the server, so popular, in fact, that it crashed the server, was the King of Rats storyline. 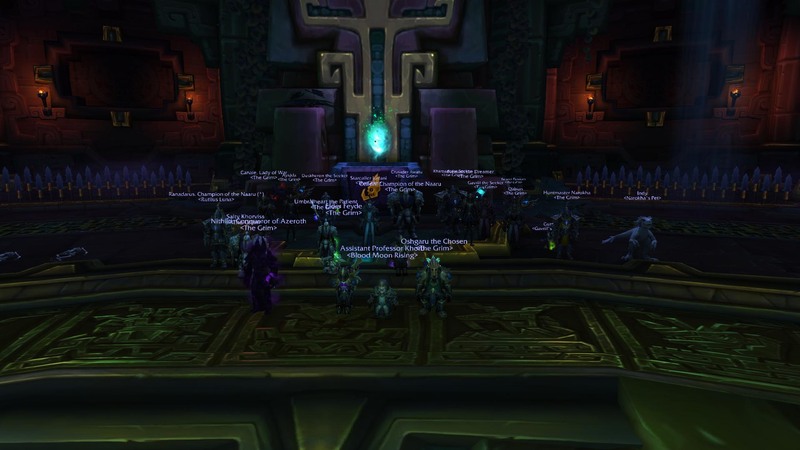 King Varian Wrynn was once found in the sewers of Alcaz Island, and The Grim made a storyline about discovering him and using him as a lab rat for plague experiments. 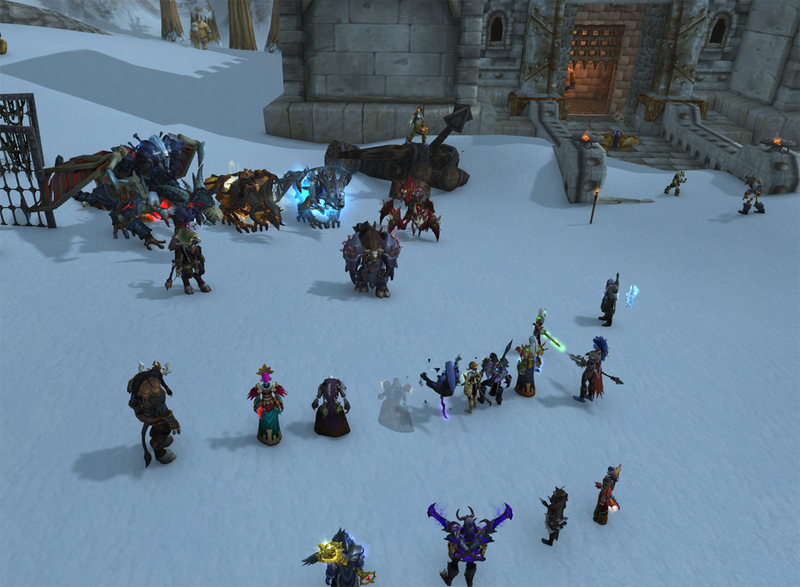 When we came back to check on the results, we were accompanied by other Horde. 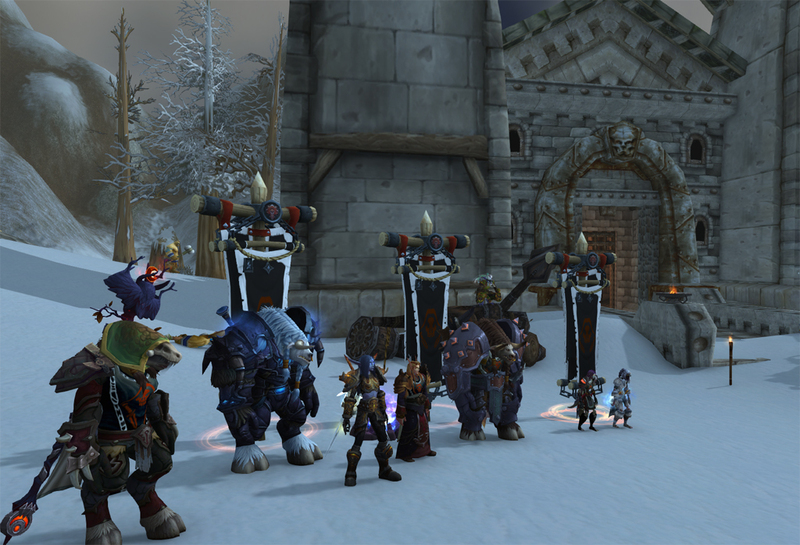 An Alliance force, led by the Ironforge Regiment, was there to meet us. 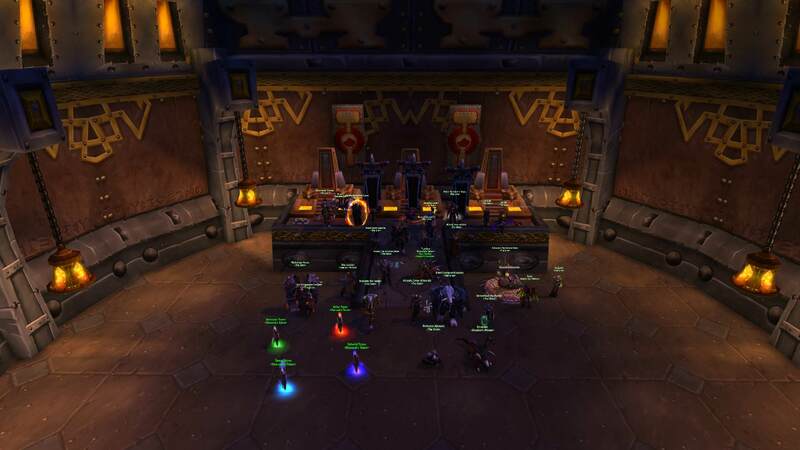 The battle was short-lived; apparently the servers back then couldn’t handle two full raid groups of Horde fighting against four full raid groups of the Alliance. Cristok’s Challenge was a popular event that started in Burning Crusades. A formal dueling tournament among Horde members, the purpose of the Challenge was to both prepare the heroes of the Horde to fight the forces of the Alliance and as a show of force. 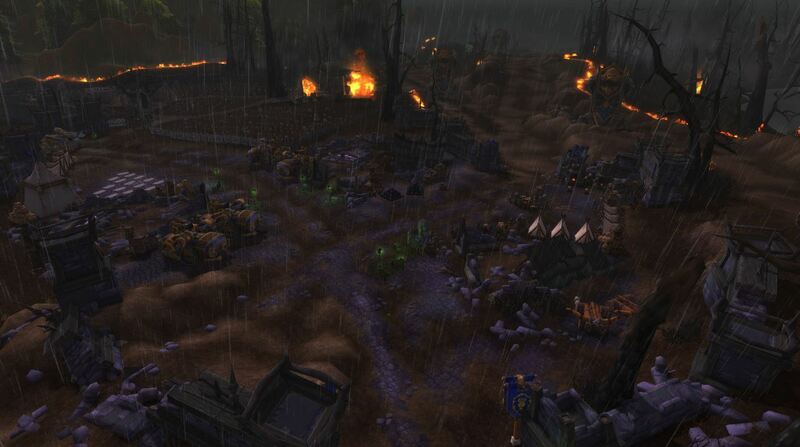 Also during this time, The Grim began weekly assaults on the fortress of Theramore. 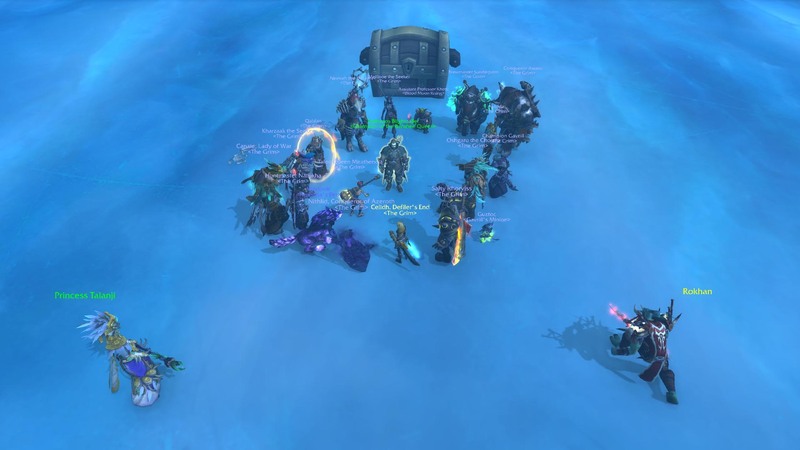 Fabled Order, an Alliance group of Paladins, stood as the main defense for the last living citizens of the kingdom of Lordaeron. 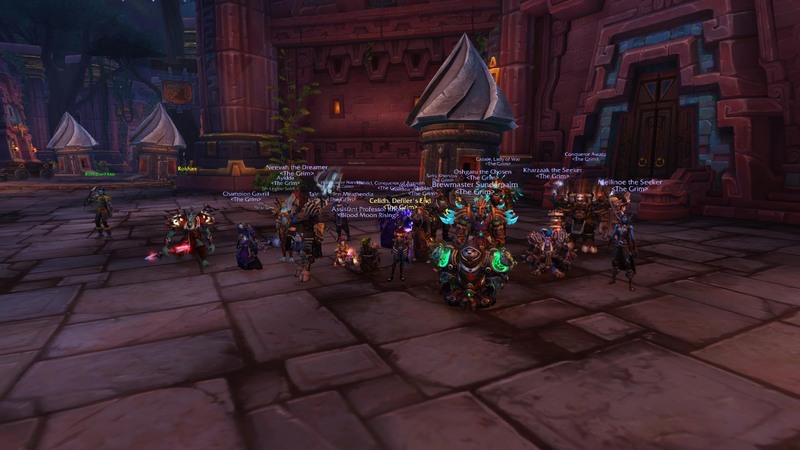 During Cataclysm, Cristok and Leyujin led Onslaughts–various RPPvP storylines and events. 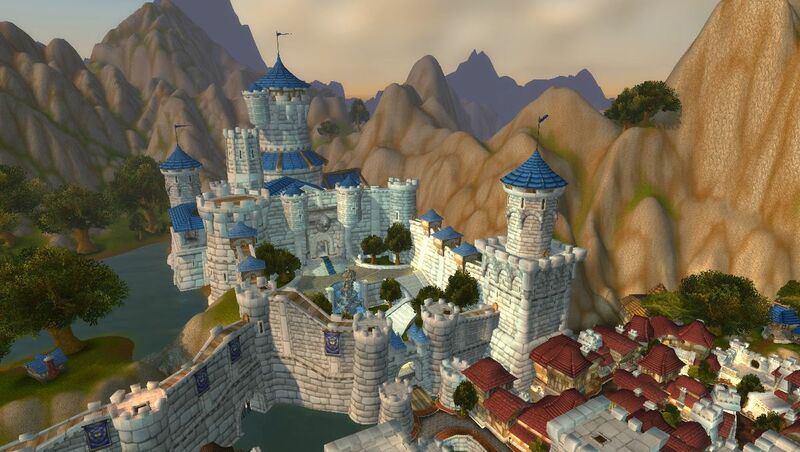 One was “The Doom of Stormwind.” In an attempt to destroy Stormwind from afar, The Grim had developed a plan to use Ragnaros’s energies, contained within a cannon shell, to be fired from Bilgewater Harbor against the White City. The plan was derailed due to the efforts of the Praetorian Guard, a highly trained Alliance military outfit that struck several successful raids against Grim depots that housed the materials needed for the superweapon. 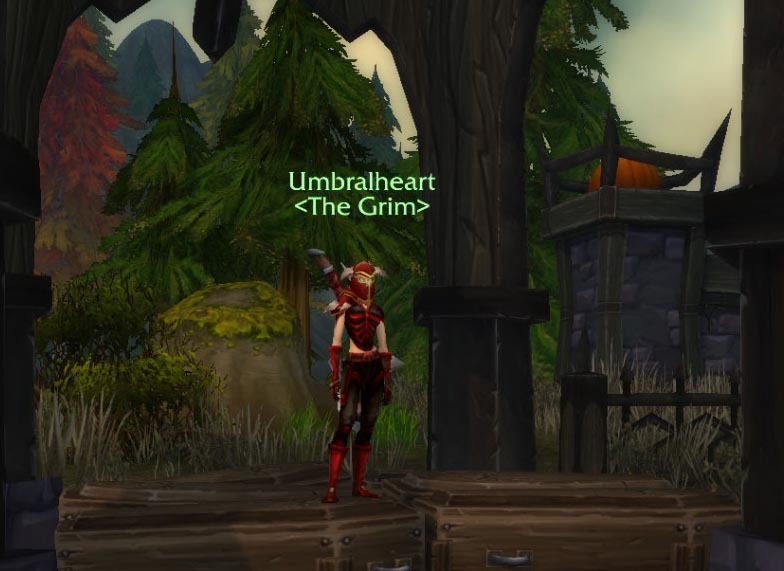 After a very long period of consideration, and trying to come up with other ideas, The Grim has made the difficult decision to move to a more active server where, hopefully, we can once again be part of an active roleplaying community in the game. 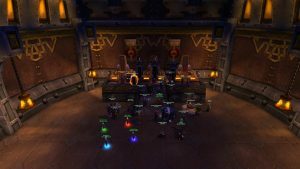 On Sunday, July 29, 2018, The Grim has transferred to Wyrmrest Accord. – Cristok, former Hand of the Mandate.